Kids love video. YouTube is the second most visited website right behind Google. The largest demographic watching YouTube are kids under 18. So, it is not surprising that social video apps are some of the fastest growing Facebook apps. This week, I downloaded the two biggest video apps, Viddy and Socialcam. Viddy and Socialcam are part of Facebook’s “frictionless apps“. In Facebook, these apps do not upload or record videos. People can only watch videos and instantly share videos. These apps specialize in short video. Viddy has a limit of 15 seconds. Socialcam has no limit but most average 60-90 seconds. However not wanting to widely publish the fact I watched “Giant Snake eats Security Guard”, I did not linger on Facebook. These apps are far more interesting when downloaded to a mobile device. On an iPod Touch, I could do a lot more than watch videos. With one click, I filmed an 8 second video. With a few more clicks, I easily added some dazzling effects and groovy club music. After adding all the extras, I immediately posted it to my video feed and shared it across my social networks. After playing with these apps, I can see the appeal. Both apps make it easy to find popular videos. Plus, it is fun adding special effects and music. But, these apps do more than just record videos. 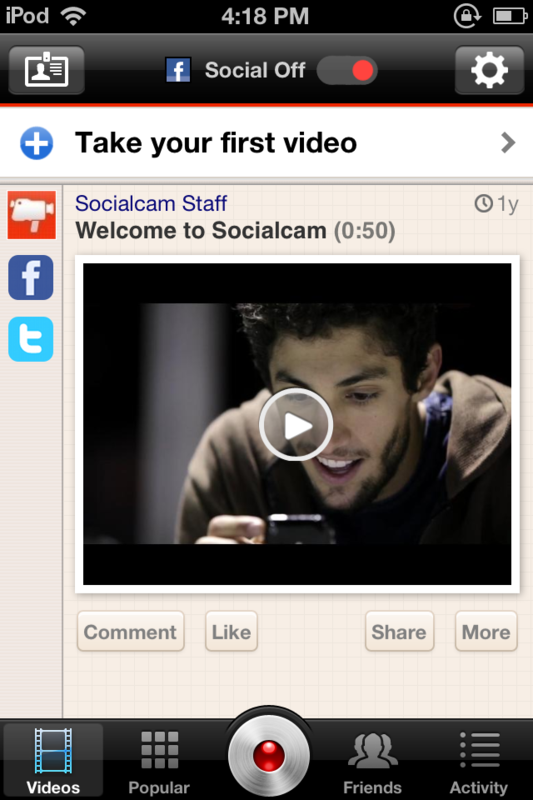 Both Viddy and Socialcam are social networks. They remind me of a lot of Twitter. Kids can choose to follow people and see their videos. In turn, anyone can follow them. Like Twitter, both Viddy and Socialcam require users to be over 13. Before sharing their first video, kids should know they have several ways to protect their privacy. On Facebook, they can use app settings to limit automatic sharing. When using Viddy and Socialcam on their phone, they can choose to have a private account or change the privacy settings for each video. Below I have included a quick guide to setting privacy levels on Facebook and in the apps. 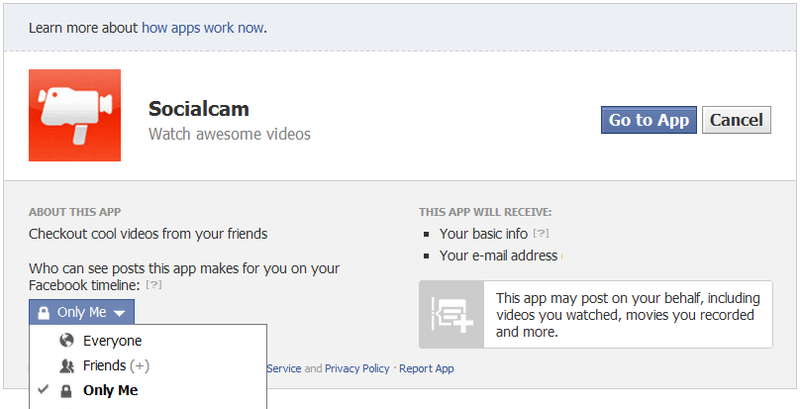 When kids download Viddy and Socialcam on Facebook, they are enabling automatic sharing. Kids may want to think twice before broadcasting everything they watch. On both Viddy and Socialcam, the creator of the video chooses the title. Some of these titles are misleading. Kids may discover the video is quite different from its provocative title. When automatically posted, friends do not know if they loved the crazy video or turned it off after 2 seconds. If kids want the freedom to watch videos without having to share it with everyone, they can change the app settings. When downloading the app, kids can change “who can see posts the app makes for you on your Facebook timeline” to “only me.” Now, friends and friends of friends will not receive a record of every video they watched. Kids can also change this setting on Facebook’s mobile app. Scrolling down the menu, kids will see “Account Settings”. After clicking “Account Settings and choosing “Apps and Websites”, they can select Viddy or Socialcam. Here, they can choose “Edit Settings” and change “Privacy for Post” to “Only Me”. 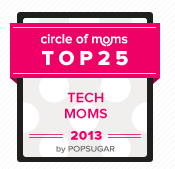 If they want to use these apps on a mobile device, they will first need to create an account. 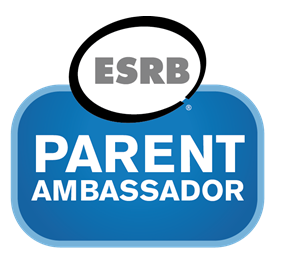 Kids can choose to sign up using their Facebook account or by entering an email. Using Facebook is quick but also ties together a lot of personal information. Viddy and Socialcam only require a name and email so it is easy to sign up without Facebook. Kids should keep these accounts separate. If kids want to control who can follow them, they should make their Viddy profile private. Private Accounts allow kids to approve new followers, approve videos shared with followers, and keep their personal profile private. However, even private videos can still appear in Viddy’s public feeds of popular or trending videos. An older teen may find a private account too restrictive. Thankfully, Viddy does not have an all or nothing privacy option. Even with a public account, kids can choose to make a video private. the multiple shadows (viewable to everyone). Viddy can link with other social networks. If kids do link networks together they can still choose to limit sharing. Linked networks will appear with a green dot. To disable sharing to that network, kids can tap on the green dot and change it to red. 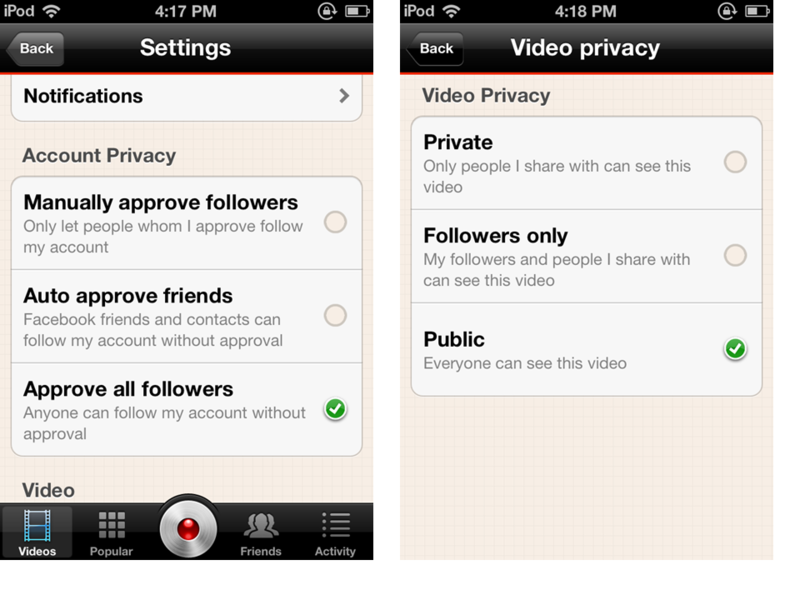 Socialcam also has private accounts and different privacy setting for each video. As shown below, the settings are slightly different from Viddy. Both options are easy to find. Kids can make their account private under settings and the options for choosing an individual videos privacy is the second choice right after adding a title. 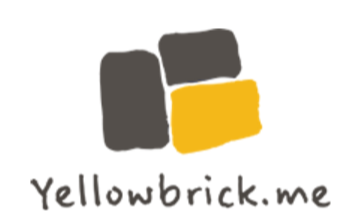 Socialcam also allows users to link to other social networks. To turn off sharing, kids need to move the button to the right to “Social Off”. Kids will enjoy playing with the special effects and watching videos with these apps. But, these apps are social networks and restricted to kids over 13. Older kids need to remember to use privacy settings. Once they post a video publicly anyone can see it, comment on it and share it. Even private videos can be copied and pasted. In either situation, kids should always think before they post. Vine App – What can you do in 6 seconds? ← Do you secretly monitor your kid’s Facebook account?